The Railay Peninsula in Krabi is a popular destination for many travelers to Southern Thailand. Although connected to the mainland, Railay can only be reached by water. There are no roads going there as it is separated by massive karst mountain formations. It is the stunning white sandy beaches – surrounded by awe-inspiring limestone rocks and it’s quiet seclusive setting – that make out the fascination with Railay. There are no roads or cars here, only foot paths. 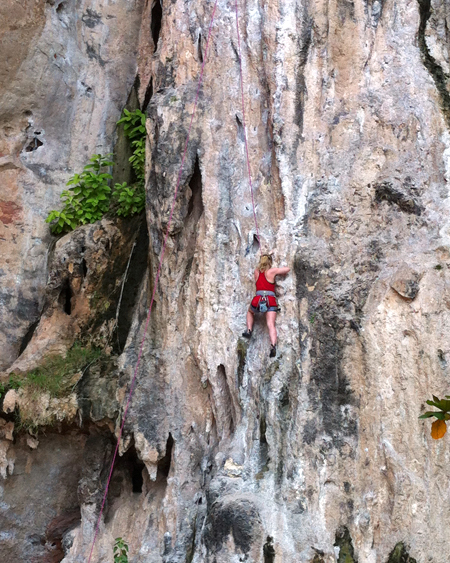 Further, Railay also is a favorite and well-known location among rock-climbers all over the world. Even beginners have the opportunity to try themselves at rock-climbing here. All this seclusive quietness comes at a price though. All resources have to be brought in by boat and all waste has to be brought out the same way. There are many luxurious resorts and restaurants on Railay, which are indeed wonderful if you are coming to be pampered during your relaxing, once-a-year beach vacation. 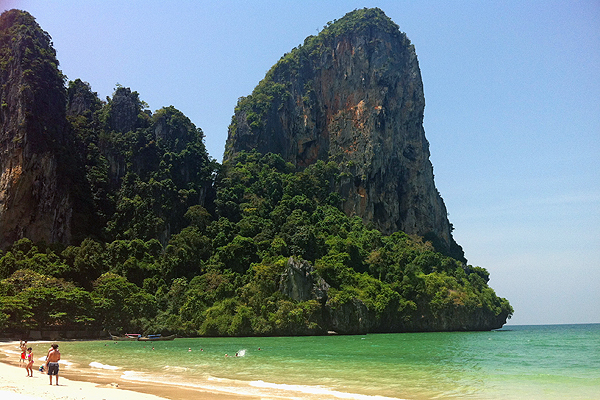 Make Krabi Town your base and visit Railay on a day-trip, or several. This way you get to enjoy the wonderful beaches and maybe even do some rock-climbing without breaking your budget and at night time you still get to experience Thai life-style and amazing, affordable food at the market. Another benefit of this is flexibility. Should it be a rainy day (not infrequent in the popular months of December and January) you can still change your plans on short notice to a non-beach activity. 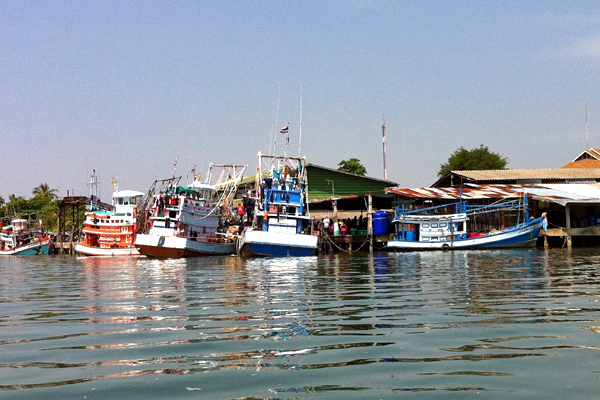 Most visitors will take a long-tail boat to Railay. To visit Railay on a day-trip we suggest to get going fairly early in the day (just to make most of your time) and head towards Chao Fa Pier on the Krabi River. While heading there you will already see boats men standing on the street corners. They are calling out “Railaaayy” or “Booaaat, booaaattt!” at pretty much everyone passing by. These are the guys you are looking for. One of them will lead you to the pier and most of the time you will be asked to wait for more passengers. 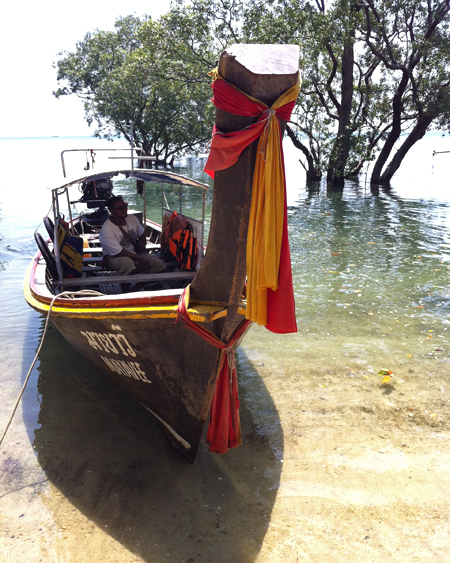 They usually wait for about 6-8 passengers before a long-tail boat will leave for Railay. 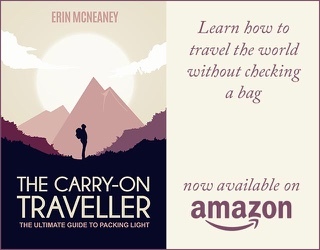 You can also arrange the trip before your breakfast and then eat while you wait. We highly recommend Relax Coffee & Restaurant. The fare during high season is 150 Baht per person one way. This is the price every one of these guys will charge and I have never seen anyone successfully negotiate a lower fare. Once a boats man has enough passengers he usually asks a few to pay him already. He gives this money – together with a large jerrycan – to a motorbike taxi driver, who – about 5 minutes later – returns with the fuel needed for the trip. When the long-tail boat is fueled, the trip to Railay begins. It takes about half an hour. If you are going in the morning, you will probably pass some larger fisher boats and see (and smell) the workers sorting through their catch. The long-tail boat will pull into Railay East. It’s counted as one of Railay’s 3 beaches, but it is actually more like a swampy mangrove and not a swimming & suntanning beach. We have only experiences coming in at high tide when the boat can go up right to the pier/promenade. If you haven’t paid already, now is the time to give your guy the 150 Baht and he will tell you at what time he will go back or when the last boat will return to Krabi Town. This is usually around 4-5 pm, this is why we recommend to get going early in the day. There are many signs and maps on Railay to help you get around. If you want to swim and enjoy some beach time, you want to go to Railay West (just cross straight over to the other side) or Phra Nang Beach. 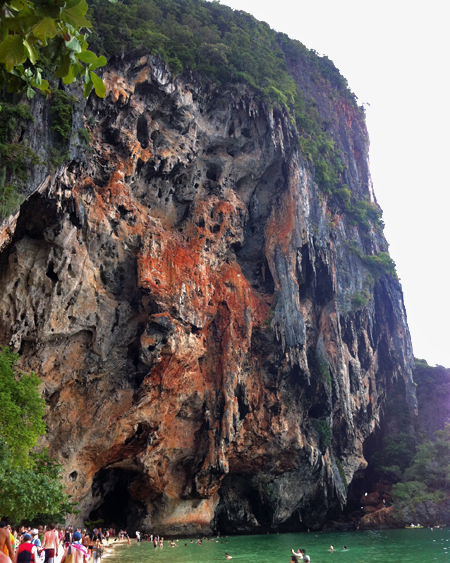 If you came for rock-climbing, you can arrange this with any of agencies along Railay East. We have no recommendations as we haven’t tried rock-climbing ourselves but we have seen plenty of rock climbing shops there. For rock-climbing, you will most likely head to Phra Nang Cave on the beach by the same name. Railay East also offers cheaper shops and restaurants than Railay West for example. If you get tired of swimming and suntanning, you can also further explore Railay on its foot paths. The maps all around point out 2 view points worth going to. After a day on this peninsular paradise when it’s time to go back (or when a rain shower surprises you) head back to Railay East. In one location on the promenade you will see the boats men again, maybe even the same one who brought you there. When he has all his passengers together he will start leading you towards the boat. 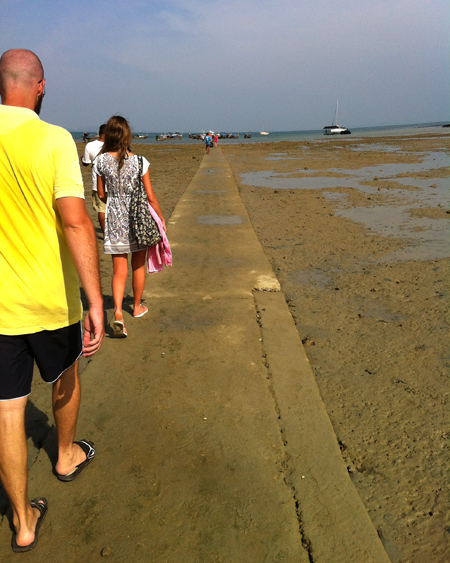 In all of our experiences this was at low tide so the boats where at anchor far from the promenade. There is a stone tile pathway through the mud but it is very slippery and after a while it will be submerged in muddy water so you won’t be able to see it. Be VERY CAREFUL not to slip or fall off the side of the walkway. Go slow and take as much time as you need. We have witnessed some unpleasant falls, mainly of passenger who had to carry a huge backpack or suitcase along the path. I really hope that in the future – different, safer logistics will be implemented here. The fancy resorts have big tractors with huge tires and a trailer transport their guests and luggage through the mud at low-tide. Once everyone makes it to the boat and another half hour ride later you are dropped off again at the pier in Krabi Town. Time to pay another 150 Baht (you pay 150 Baht going there and also when you come back). 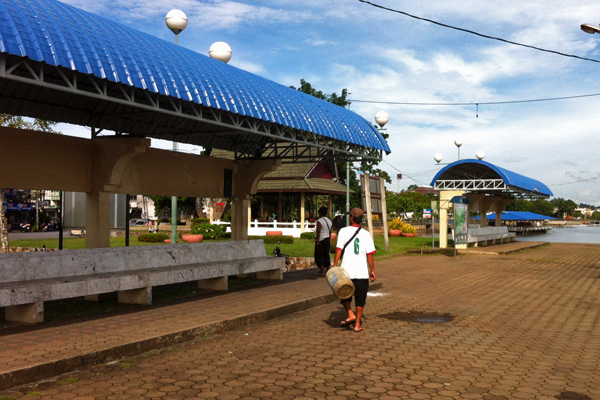 You will now see that the big empty area at the pier (in Krabi town) has transformed into a buzzing night market. Don’t miss the experience of having some amazing, freshly prepared Thai food here after a shower and short rest. Rinse and repeat the next or another day, if you really enjoyed Railay and the weather plays along. I remember the guys trying to rip me off on the return journey. I needed to get back to the main coastline that morning and they overcharged considerably. I hate it when people take advantage ‘because you’re a tourist’. Wouldn’t have missed it for the world though. I know…this can be so annoying! We sometimes had issues with songthaew drivers more than doubling the fare for us. That’s how we learned to have exact bills/change when you know what the price is supposed to be. is this railay beach include already in four islands tour? 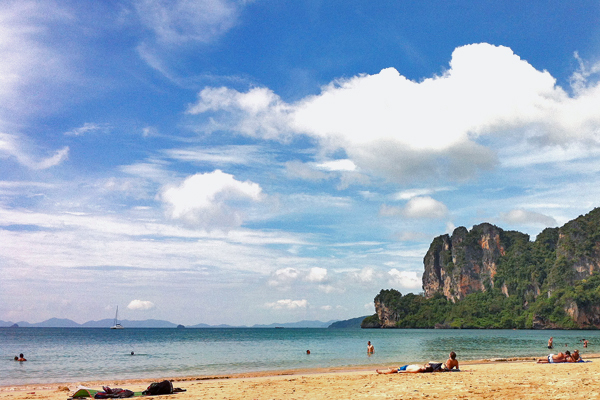 or we have to go to this railay beach in a separately day?